Because I am a crazy person, I've decided to start another Let's Read. The monsters were my (and seemingly everyone else's) favorite part of my LR of the Epic Level Handbook, so why not do a LR of all the 3e monster books? I'm not going to do the original Monster Manual, since that has already been done better than I ever could. I'm also skipping the Fiend Folio, because Dweller is covering that right now. My intent is to cover the Monster Manuals 2, 3, 4 and 5, probably one per thread. So before the voice of sanity can get too loud, let's get started! Oh my. That is a cover all right, but I'm not sure exactly what it's meant to depict. We have the metallic border and green, scaly-looking background, but then there's a sort of toothy mouth-hole wrapped in webbing. And more teeth - spines? spikes? - poking out randomly through the scales. And . . . what is that in the middle? An eye? A tiny planet? Is it meant to be something the mouth-hole is swallowing, or part of the creature? The cover definitely gives the impression of monster, but it's kind of a weird, inchoate impression when you actually start to examine it. 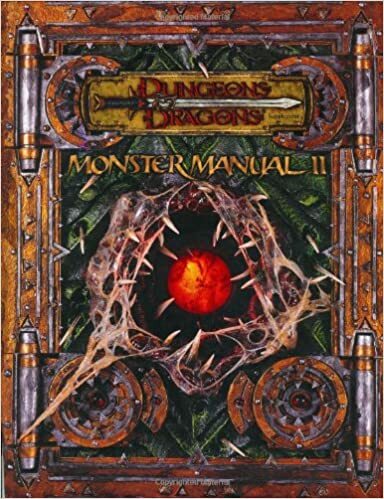 Anyway, the Monster Manual II was published in September 2002 for the then-current 3rd Edition of D&D. This is for 3.0, not 3.5; I know WotC later released errata to update it, but we're going to be looking at it as it was first published, warts and all. And hoo boy, does it have some warts. I love monsters, but some of the beasties in MM2 are just . . . bad. We get the usual table of contents, followed by monsters arranged by type and subtype. After that comes seventeen pages of information on monster types, terms, and rules. This is entirely redundant with the first MM, so I'm not sure why it's reprinted here; I can't imagine someone having the MM2 and no other 3.0 books. It feels like a huge waste of pages which could have been filled with a good 8-16 more creatures. This is gonna be a wild ride. Always useful for this kind of threads : The official art gallery for the MM2 in the ruins of the old Wizard site. Some of them look really cool. Some of them look really WHAT ? Bee People. Why did it have to be Bees? At this rate I may need to finish my Ravenloft MC lets read. Looks like Lets read are becoming the hot new thing again. I love it. I haven’t read this book, but that art gallery has me exited for some weird nonsense. There's some fantastic art in this book. The stats are.... look its a 3rd edition monster manual okay? I think its well established by this point that coherent monster design was not a card in their deck, as we will soon see. But some neat concepts were to be had. The flesh jelly is pretty much the grossest monster illustration ever, for me. No gore or anything, just ... gross. Remember the Atropal from the Epic Level handbook? And the 5th edition Mane. Plus the 2nd edition Formorian and Veerbeeg are kind of hard to stomach.